Shaving is one of the best ways that you can keep yourself looking fantastic. There are a number of ways that you can have a good shave, but the best way to shave correctly is by shaving in the shower. Like it or not, people judge you by the way you look. It can help or hinder being hired. A close shave can be a turn on to that special woman in your life. The bottom line is that shaving in the shower can certainly enhance the way you look at your job, on the social scene and at home. Traditionally, you may assume that the best way to shave is in front of a bathroom mirror. The reality is that shaving in the shower can protect your skin. Take note that facial skin immediately begins to dry and change after it is away from the constant water and moisture that abounds in a shower. While having a shower, hot water can soften whiskers as well as skin pores. Both of these things can create a closer shave that is hard to replicate outside a shower. Besides this, some men experience ingrown hairs or redness, and it can be attributed to shaving in front of a bathroom sink. When you shave in the shower, it can prevent these and other similar things from occurring. Before focusing on shaving in the shower, you need the right equipment. After all, you really do not want to go through the shaving motions in the shower and still have a face that does not look great. Having a good blade is a great start to ultimate smoothness. Shave cream or shave gel is also an important tool. Do not become a cheapskate with these items. If you want to get close to that special someone or have that baby face look wherever you go, spend the money and get some of the best items that are available in the market today. 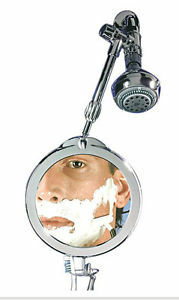 Once the shaving tools have been selected, it is now time to select the right type of shower mirror. Many think that it does not matter what kind of shower mirror is used because all shower mirrors are the same. That is not the case. Keep in mind that some shower mirrors require an adhesive, like a suction cup, that needs to be attached to the shower itself. Other mirrors are designed to be placed anywhere within a shower and stay without falling. Furthermore, consider the size of the shower mirror itself. You should be able to see your face, or at least a good part of your face, in the mirror itself. Finally, make sure the shaving mirror does not fog. It helps to a check to see that a mirror clearly states that it does not fog up in the shower. When the shower mirror has been purchased, it is now time to decide where it should go. You want the mirror to be placed where you can see it without being deterred by frequent water flying in your face. Find a wall or a corner that does not get very much shower spray. Once the location has been selected, it is vital that the mirror is a good height that is close to eye level. Shaving should be the last thing that is done while having a shower. Lather up your face and be prepared to add more shaving cream if it immediately is rinsed off. Use the razor to do an efficient but appropriate swipe against the bristles. The shaving act should go quickly. However, do not push too hard on your face. Although the steam and moisture seems like it is just fine, facial skin can display displeasure after the shaving has been accomplished. When the shower is complete and you are drying off, apply some after-shave lotion to ensure that your facial skin stays healthy and vibrant for the rest of the day. If you are planning to put on cologne, make sure that the after-shave is fragrance free. You certainly do not want multiple scents that conflict and can act as a repellent to everyone. The bottom line to shaving in the shower is that this new art that may take some time. At first, it may seem hard to do, but it is definitely worth it. After all, you are worth it. Give yourself an extra five minutes in the shower to make sure you are shaving correctly. It will help you to look fresh not only through the day, but into the evening as well. This can be fantastic if you are going on a hot date or getting together with the guys to see a college game at the local sports bar. Therefore, get that shaving mirror and be ready to look fantastic.